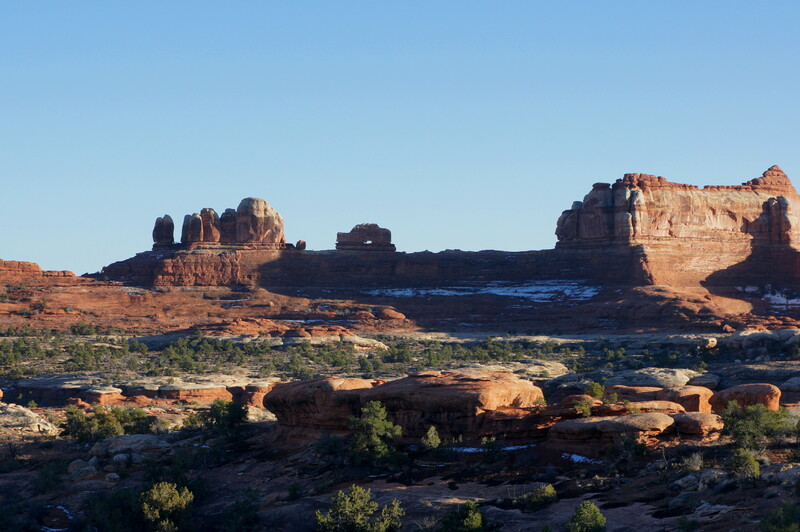 Canyonlands National Park’s Needles District comprises more than a hundred square miles of spindly spires, dizzying canyons, and colossal views. It also boasts some of Utah’s best hiking and backpacking opportunities, including the Chesler Park Trail, the Big Spring – Squaw Canyon Loop, and the Confluence Overlook Trail. Yet visitors making the 1 ½-hour drive from Moab to the Needles are in for a treat even before they arrive at Canyonlands. From Moab—the oft-touted epicenter of “Slickrock USA”—Highway 191 follows cliffs of reddish Wingate sandstone as it bears southeast through broad Spanish Valley. 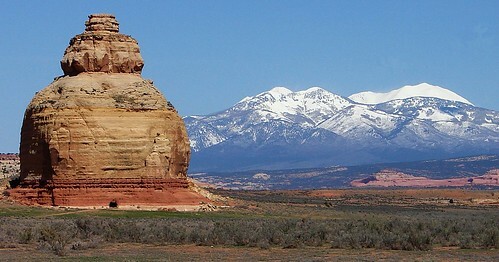 The pointed La Sal Mountains peek over the cliffs to the east. 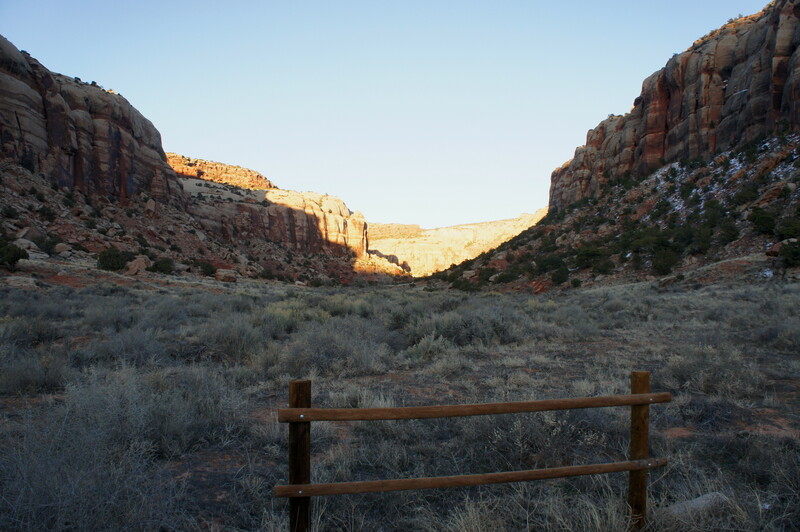 Around fourteen miles from central Moab, the road drops into Kane Springs Canyon, then traverses Muleshoe Canyon a few minutes later. (Note: Skip the obnoxious “Hole N’ the Rock” tourist trap on the left.) 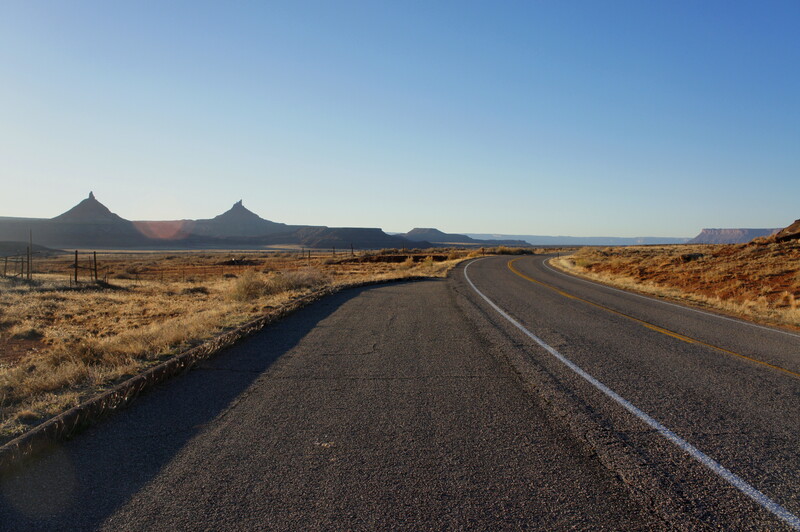 Beyond Muleshoe, it is seven miles of open country to Wilson Arch, a natural span notable for its accessibility just off the east shoulder of the road. More than a dozen side canyons feed into the primary drainage—Indian Creek—between Newspaper Rock and the Needles. Among the most popular is Donnelly Canyon, where one will find a large, paved parking lot with a pit toilet. 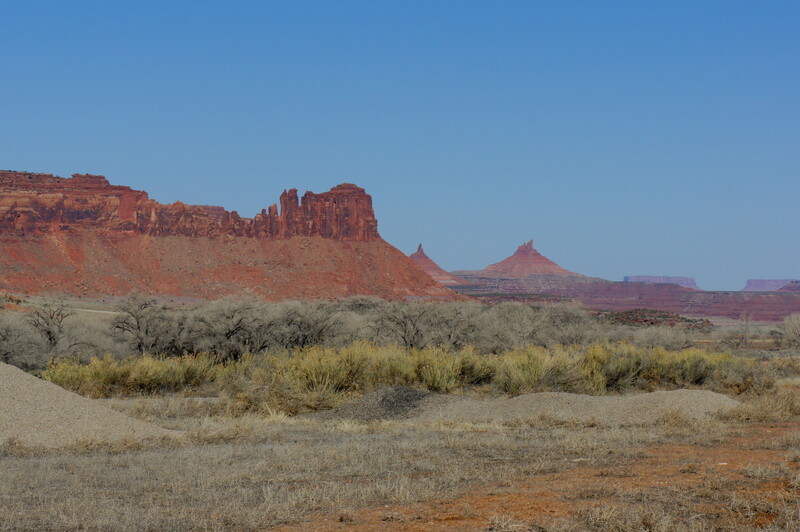 Farther along, four-wheel drive tracks bound for Lavender and Davis Canyons (inside Canyonlands National Park) leave Highway 211 on the left. Separating these two canyons is Bridger Jack Mesa, which at its northern tip narrows to a thin, cragged promontory lined with Wingate sandstone spires. 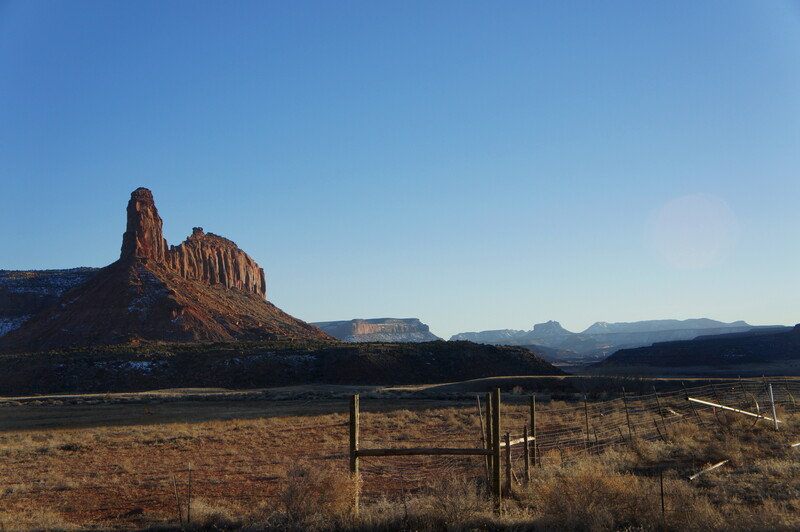 By now, Indian Creek Canyon has opened to a wide basin reminiscent of world-renowned Monument Valley. The two most prominent spires to the west are North Sixshooter Peak and South Sixshooter Peak, divided by the amusingly named Bogus Pocket. On the opposite, east fringe of the valley, walls of Wingate sandstone rise upwards of 1,000 feet. While the predominant rock layers in Indian Creek (Navajo sandstone, Wingate sandstone, Chinle formation) date to the Jurassic and Triassic Period (250-150 million years ago), the canyons of the Needles are, as a general rule, carved into the older Cedar Mesa sandstone—deposited in the Permian Period (300-250 million years ago). The “needles,” “grabens,” “horsts,” and “mushrooms” of the Needles owe their existence to a prehistoric uplift, as well as the presence of salt deep in the bedrock. It is roughly 34 miles from the junction with Highway 191 to the Needles Visitor Center, a distance that takes at least 45 minutes to cover. 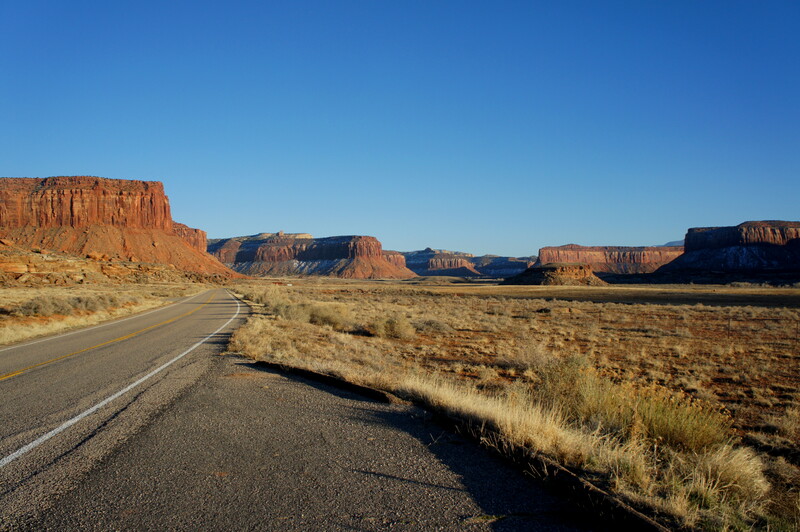 Moreover, it is easy to find enough distractions along this drive to fill an entire day…even without reaching Canyonlands’ Needles District, which demand days to weeks of exploring on their own. 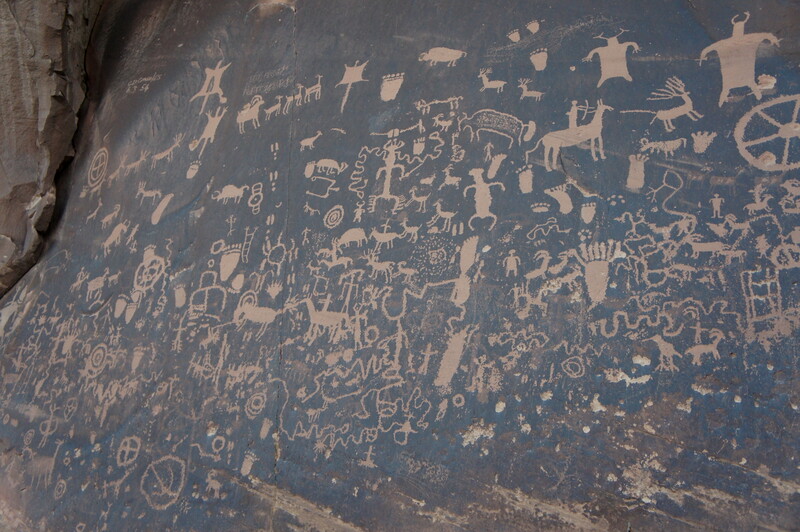 This entry was posted in Canyonlands National Park, Scenic Byways, Utah and tagged Bridger Jack Mesa, canyon, Canyonlands, Donnelly Canyon, Highway 211, Indian Creek, Indian Creek Recreation Area, Moab, Needles, Newspaper Rock, petroglyphs, scenic byway, Sixshooter Peak, Utah, Wingate sandstone. Bookmark the permalink.